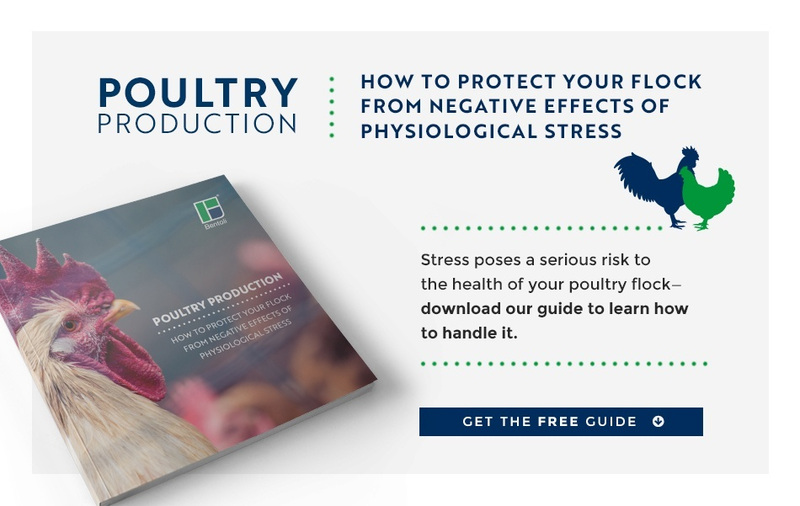 Poultry health problems can range from mild to life-threatening and many diseases have the ability to spread through flocks in a matter of days. This makes it vital to recognize the symptoms of common poultry health issues, in order to address the situation and find a solution. Most health issues in poultry are a sign of nutritional deficiencies caused by illness or environmental factors. Each category has a variety of symptoms that can be used to identify and—with the help of a veterinarian—diagnose health problems affecting your poultry. Once you have a diagnosis, you’ll be able to provide a diet that helps reverse nutritional deficiencies and restore health. Let’s look at the 5 categories of poultry health issues and some of their related symptoms and causes. Impacted crop—symptoms include little or no appetite, low-activity, and a firm crop. Oral canker—symptoms like weight loss, reluctance to eat, and plaque in the mouth are common. Sour crop—symptoms include a thickening of the crop wall, dilation of the crop, loss of conditioning, and sometimes death. An impacted crop can be the most severe of the 3 cases and occurs when food is blocked from entering the stomach and remains in the crop. This blockage can be caused by poultry that consume long grass stems, string, or plastic. Failure of normal muscle contractions can also cause an impacted crop. The list of diseases and conditions that can affect the nervous system is lengthy. In some cases, diseases will impact both the nervous and respiratory systems. Viral infections. Avian influenza is the most well-known type of viral infection among poultry, but others include Marek’s Disease, Newcastle Disease, and Eastern Equine Encephalitis. Soughing, sneezing, gasping, discharges, diarrhea, conjunctivitis, swelling, and discoloration are the most common symptoms. Bacterial infections. Fowl cholera and botulism are common types of bacterial infections. Fowl cholera symptoms can include swelling, paralysis, low egg production, and a darkened head. Botulism symptoms typically include diarrhea, sleepiness, and the inability to control the head. Fungal infections. A prevalent fungal infection in poultry, Aspergillosis, is a common type of mycotic pneumonia caused by mold. Symptoms can include gasping, gurgling sounds, respiratory problems, and death. For more information on recognizing mycotoxin poisoning caused by mold, read this guide on How to Recognize Mycotoxin Symptoms. Curled and crooked toes. This occurs as a result of a poor diet that lacks riboflavin. Inbreeding and improper regulation of incubation temperatures can also cause crooked or curled toes. Slipped tendon. Also called Perosis, a slipped tendon is a metabolic disease that deforms the legs of chickens, turkeys, and ducks. It is caused by a deficiency of trace nutrients—especially choline and manganese. Mycoplasma synoviae. This is an infection that can cause lameness, swelling of the hocks, feet and shanks, as well as depression. Make sure poultry have access to a diet with optimal nutrients that will allow them to maintain ideal skeletal and muscular health. Excessive stress. Predators, moving to new locations, loud noises, and other disturbances can cause poultry stress. Extreme temperatures. Severe cold or excruciating heat can cause poultry to become sick. Mold and dust. Mycotoxin poisoning and high levels of dust in a coop environment will wreak havoc on respiratory health. Some of the most common signs of respiratory problems include sneezing, a runny nose or eyes, and swollen sinuses. If the disease has the potential to spread quickly, antibiotics can help restore birds’ health. Avian leukosis. This retrovirus is transmitted through mating or by biting pests, like red mites. Avian leukosis causes tumors to grow in organs, such as the spleen, kidneys, and liver. Acute heart failure. Most common in large poultry, acute heart failure does not usually show symptoms and often results in death. Supplying a diet rich in nutrients can help to avoid cardiovascular and organ problems in your flocks by keeping them in prime health. It’s better to prevent poultry health problems than to deal with the consequences later. The best form of prevention is a nutrient-rich diet that supplies vitamins and minerals poultry need to sustain healthy body functions, which will help them fight off sickness and disease. Nutritional feed additives provide an excellent dietary source of nutrition and often include antimicrobials and anti-stress agents to help birds maintain calm, productive daily routines. Adding supplements directly to livestock feed—either during the manufacturing process or during feeding—will support robust growth and strong production rates. Minerals, which can be used to improve conception and weaning rates, as well as immune response and overall poultry health. Vitamins, which support optimal growth rates and bone development, and improve nutrient absorption while fighting deficiencies. Making sure that poultry have access to proper nutrients every day is a vital component of raising a happy, productive, and profitable flock.